Published by Oxford University Press in May 2014, Is the Planet Full? is a volume of essays edited by Professor Ian Goldin. What are the impacts of population growth? Can our planet support the demands of the ten billion people anticipated to be the world’s population by the middle of this century? While it is common to hear about the problems of overpopulation, might there be unexplored benefits of increasing numbers of people in the world? How can we both consider and harness the potential benefits brought by a healthier, wealthier and larger population? May more people mean more scientists to discover how our world works, more inventors and thinkers to help solve the world’s problems, more skilled people to put these ideas into practice? Readership: Scholars and students (undergraduate and graduate) in the social sciences. Topics of related study include population, demography, development, leadership, public policy, management of global challenges, and social and environmental systems. Also available in French and Czech translations. 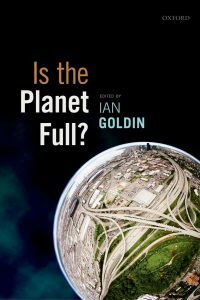 Ian Goldin spoke about Is the Planet Full? on Saturday 24 May at the Hay Festival. Professor Charles Godfray and Professor Yadvinder Malhi also spoke at Hay, talking about their chapters of Is the Planet Full? on Saturday 31 May. In a separate event on the same day, Professor Sarah Harper spoke about her chapter, and also about her new book, The End of Population Growth? Ian Goldin appeared at The Wilderness Festival on 10 August and at The Times Cheltenham Literature Festival on 11 October.